This is not the end of the Space Exploration it is just the end of the begining. May they all go safely forward into the future. 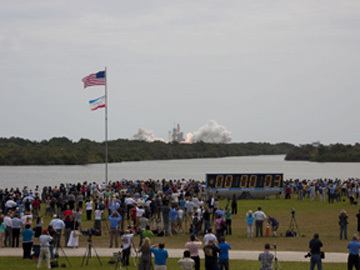 I did not have the money to travel to Floria last Friday but I took a day off (strange enough for some people around me)to watch the last shuttle launch on NASA TV. Despite poor weather forecast I exactly thought what you wrote, from ET fueling to the final seconds of the countdown, even when the clock stopped at T-31. It could happen. That is why I had to smile when I read your lines. When the Shuttle soared into the sky I felt both relieved and sad. For so many years the Space Shutte was part of my life. I enjoyed the great accomplishments and I shared the darkest hours. Although I am looking foward to the new things to come the end of the space shuttle program will leave a small empty space in my life which cannot be filled up. Anyway, new people will come and do new amazing things. Let’s give them the chance to go beyond.